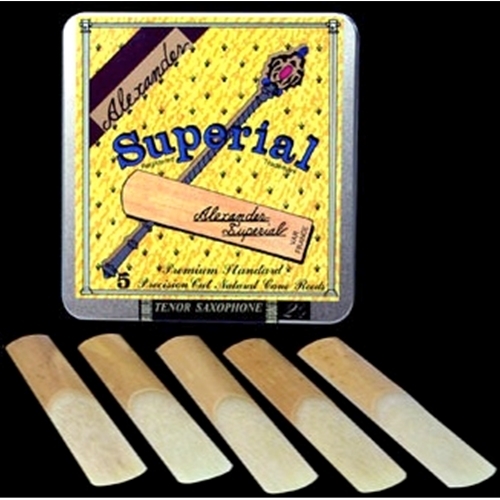 Alexander "Superial" Baritone Saxophone Reeds No.2.5 From the Alexander website - In the early 1990's, after many months of intense development and testing of prototypes, the original "Alexander Superial" was put into production. Our aim with this first model was to design a reed which produced a warm, resonant "buzz", good projection, even scale throughout the registers, and a wide dynamic range. In other words we wanted this reed to provide a tonal platform that was free blowing, capable of quick and accurate articulation, and one that gave immediate presence. This was in line with the tonal concept of the "American" style single cut reeds, but with more developed heart and rear vamp area, one with "spring" and natural resilience needed to produce a really big sound. We ran an extensive testing program with various professionals and we were also fortunate enough to have the valuable feedback from the renowned veteran mouthpiece maker Ralph Morgan, his excellent crew and others. After all our testing confirmed the good results of the final prototype, we believed we had finally come up with a reed worthy of manufacture. The combination of a new design influenced by traditional reed making concepts (and therefore in essence "time proven"), and the highest grade of cane we could find, became born as the original Alexander Superial with its yellow labeled tin.